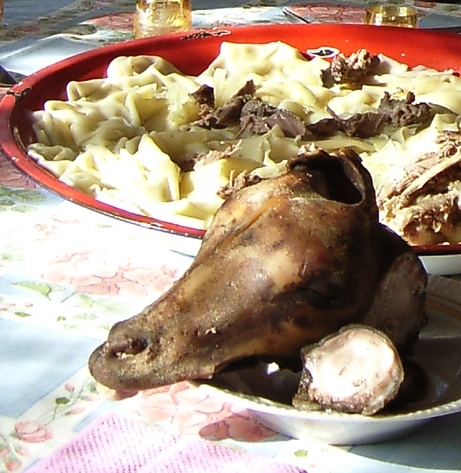 Besh barmak is a popular dish in Kazakhstan and also eaten in Kyrgyzstan. It is known in Xinjiang as well, where it is commonly called Narin. The term Besh barmak means "five fingers", because the dish is eaten with one's hands. Besh barmak consists of boiled horse or mutton meat with small pieces of pastry boiled in broth and sprinkled with parsley and coriander. The meat is usually diced with knives and often mixed with boiled noodles. It is usually served in a big oval dish. Treating to beshbarmak is accompanied with an original ritual. The meat itself is served in large pieces. Beshbarmak -is usually served with ak-nan - special flat bread baked with onion, and sorpa - mutton broth in bowls called kese. ‘Amen’ is always said at the end of the meal to give thanks to God. Beshbarmak is traditionally served according to the ritual. The koy-bas, or sheep's head boiled in a kasan (a type of large cooking pot), is put before the most honorable guest, usually the oldest one. This person cuts the bits and parts from the head and offers them to the other guests at the table. The younger adults often receive the bones of the legs and shoulders. Youths are given sheep's ear with the wishes to be careful; girls get a palate so as to be diligent. The other parts of the carcass are not considered any less meaningful. Most respectful guests are treated to gammon and shank. A young bride receives the brisket; married women instead take the neck-bones. Boys and children are given the kidneys and heart, which are supposed to make them mature; however, children are not allowed to eat sheep's brain because it is believed to make them weak-willed. Knuckle is never served to a young girl because of the belief that it will cause her to forever remain an old maid.